The MOD project to remove oil from the wreck of the RFA Darkdale has now been completed and today sees the departure of the team and vessels from James’ Bay. “On Thursday morning we completed the removal of oil from the final tank of the RFA Darkdale wreck. The total amount pumped off the Darkdale was 1944 cubic metres. Most of the oil that came off the wreck was of surprisingly good quality, given that it has been in the wreck for so many years. It is now all onboard the tanker, the Golden Oak, and will be taken to a refinery for reprocessing. “We have removed all the oil that can be pumped from the wreck, but there will be still be some small amounts of residue left. And removing the oil will have changed the distribution of weight within the wreck, so it is likely to take several months for the Darkdale to settle on the seabed again – and during this time, small leaks of residue are possible. 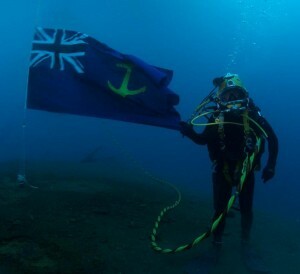 “One of the final dives the team did was to raise a Royal Fleet Auxiliary Ensign on the wreck (pictured), the flag the RFA Darkdale would have flown herself. This flag was raised by Gordon Vickers on behalf of all the project team as an act of remembrance for those who lost their lives onboard the Darkdale.